Generally speaking, those outside of Iceland have known little about it other than it is a small barren country with extreme weather. This is due in large part to the fact Iceland is located at the top of the world, bordering Greenland. To say Iceland is off any well-paved tourist routes is an understatement. So for a long time it was assumed that only those intrepid travelers eager to get as many passport stamps as possible would be ambitious enough to visit a country that most outsiders only knew as having too much snow. But as word gets out about this small Nordic island country, more and more people want to visit. And those that do return with tales of a country rich with natural beauty, jaw-dropping landscapes and a deep cultural heritage. Iceland isn’t just for backpackers anymore – the whole family is welcome. So with that in mind here are some of the top attractions for those visiting Iceland for the first time. 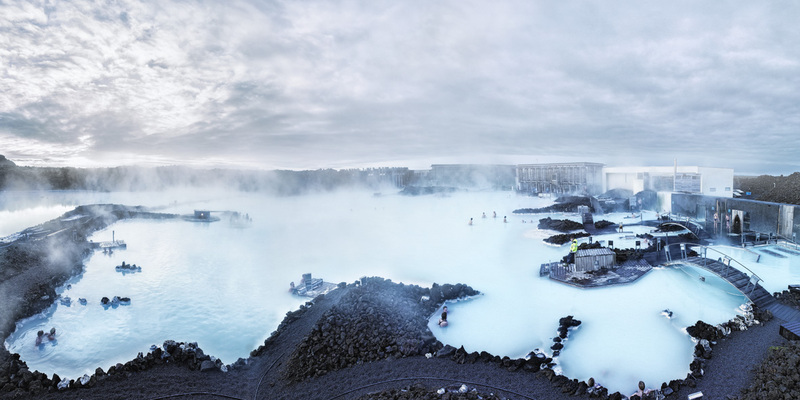 This iconic geothermal lagoon is one of the few sights known by many people outside of Iceland. Located near the capital city of Reykjavik, this natural spa is said to have special healing powers. At the very least it delivers in supreme relaxation, as there’s nothing quite like wallowing in perfectly warm water amid freezing outside environs. Something else Iceland is known for – and something it has in abundance – are glaciers. In fact, 11% of Iceland’s total area is covered by these natural phenomena. The small fishing village of Hofn is popular with visitors looking to experience glaciers, as there are many in the surrounding mountains. However, Vatnajokull remains the most popular glacier, as it is the largest in Europe. Undoubtedly Iceland’s most popular tourist attraction, whale watching is an Icelandic activity that showcases nature in all its awesome glory. There are many locals suited for whale watching in this country but Husavik is generally regarded as the best place to embark on this particular activity. Home to the aforementioned largest glacier in Europe, Vatnajokull also happens to be the largestnational park in Europe. Not only that, but visitors to Vatnajokull are privy to the natural splendor that is Dettifoss, Europe’s most powerful waterfall. The park also offers world-class hiking across its breathtaking landscapes. Iceland is best visited during the summer, when the climate is more moderate and the sun hardly sets. And there’s no more festive day during Iceland’s summer than the 17th of June. This date marks the birth of the Republic of Iceland, and parties throughout the nation rage. The bet place to experience the festivities is in the capital city of Reykjavik, as the folklore and concerts are ubiquitous. The best way to experience the glaciers of Iceland up close is on a day-trip or excursion to swirling glacial pools. Not only that, but many tour operators offer adventure expeditions throughout the many fjords and bays around the island nation. Many tour operators also offer popular day trips river rafting down the picturesque Hvita River, which is part of the “Golden Circle” of nature excursions. This is the most popular tourist route in Iceland. It encompasses 300 km, from Reykjavik to the center of the island and back. Tourists on this excursion experience lush valleys, active geysers, majestic waterfalls and massive volcanic craters. It’s the best way to fully immerse oneself in Iceland’s rich natural beauty. In many respects, there is a dichotomy to Iceland that is as much about evolution as it is timeless nature. Much of this country’s heralded landscape is untouched and unchanged since the days of the Viking settlers. Other areas continue to be carved out by glaciers and are still taking shape. This all combines to make the country and its wilderness and wildlife a must-see for those looking to experience earth’s unspoiled natural wonders. Magnus Hirst is a tour guide and Social Media Coordinator at Icelandic Travel Market, a leading Iceland tours company specializing in bus tours, Iceland day tours, jeep tours, Iceland group travel, glacier walks, whale watching tours and more.